Posted on September 26, 2016 June 9, 2018 by NGCHS, INC.
George Crook was born on September 8, 1828 near Taylorsville, Ohio. He graduated from West Point in 1852 and was assigned to fight Indians in the Pacific Northwest. Crook rose steadily in rank. He was sent East to fight in the Civil War where he commanded an Ohio Volunteer Regiment, eventually reaching the rank of Brevet Major General. After the war he returned to the Northwest where he commanded the Department of the Columbia and gained fame there as an Indian fighter. Indian troubles continued to mount in the Southwest and resulted in the transfer of General Crook to the Department of Arizona where he relieved General George Stoneman on June 4, 1871 Stoneman was a desk soldier and ineffectual in dealing with the continuing problems plaguing the district. Crook arrived in Tucson on June 19, 1871 and immediately set about familiarizing himself with key civilian authorities and his officers. He extracted from them important information on the geographical characteristics of the District of Arizona and the nature and strengths of his Apache adversaries. He also learned which Indians were not hostile and soon used this information to his advantage. Crook knew that it would require special skills to fight the Apache’s type of guerilla warfare. Previous military commanders had used friendly Indians as trackers and scouts. Crook realized these Indians could be trained to obey military commands and use firearms the same as the soldiers. Credit must be given to his “Apaches Scouts”, as they were called, for their important contributions to subsequent military victories. Within a month of his arrival, Crook was ready to mount an expedition into the field to study the country for himself and to familiarize his officers and men with his methods of combat. He left Tucson on July 11, 1871 for Fort Bowie, then on to Camp Apache, continuing across the Mogollon Rim to Camp Verde, and eventually on to Fort Whipple near Prescott. A travel distance of about 600 miles. His route approximated the present course of the Crook Trail, vestiges of which can still be seen today. (The route started as a pack trail but was eventually improved to handle wagons in 1873 – 74). Crook established his headquarters at Fort Whipple. Here he started planning his first campaign against the hostile Apaches. However, he was abruptly ordered to cease operations due to the impending visit of a peace commission headed by Vincent Collier. The politicians in Washington had enlisted the help of Eastern church groups to pacify the Western Indians. Despite some success with the Eastern Indian tribes, Collier had little success with the Apaches and after a flamboyant few months he was recalled in disarray. In the meantime Crook had been learning and teaching. It was important to him to understand his friends and his adversaries. He instructed his command on the intricacies of the pack train, the instrument of supply which enabled units in the field to be mobile for extended periods of time. This knowledge became very beneficial in subsequent campaigns against the Apaches due to their “hit and run” method of combat and the rigorous terrain where most of the action took place. Crook stood a bit over 6 feet tall, was strong and agile, and in perfect harmony with the outdoor life. He loved hunting and fishing. 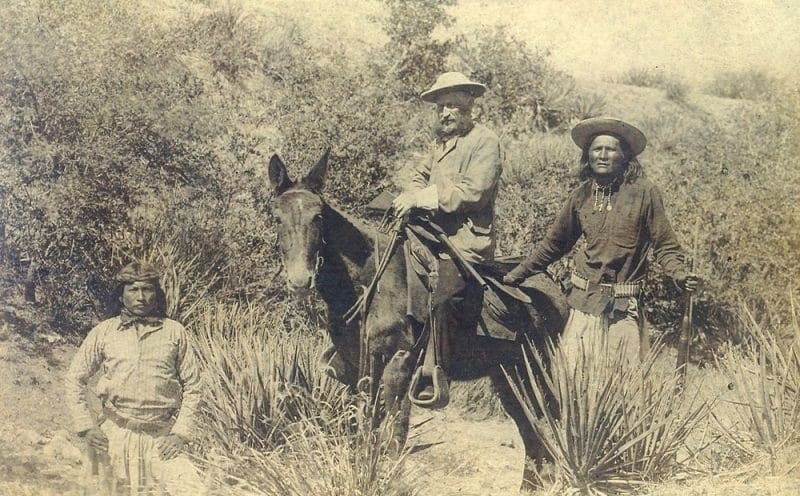 To the dismay of his fellow officers, often he would wander off alone with rifle or shotgun to pursue game, either on foot or mounted on his favorite war mule “Apache”. By character he was taciturn, reticent, modest to a fault, fair, honest and a good listener. The Indians called him the “Gray Fox” because of his grizzly gray hair and his prowess in battle. Although he could be brutal in combat he preferred to salvage rather than destroy human lives. For this he was sometimes criticized by his superiors as being “soft” on the Indians. Nonetheless, his methods proved to be effective and fair in the ensuing campaigns. If other officers and civil authorities had shared this same wisdom the Southwest Indian wars would have been far less traumatic for all concerned.